Today we can utilize modern technology: video cameras with a color monitor that can be visually seen by ourselves and our clients during the inspection process. We use the latest in sewer camera technology to see what is happening deep in the pipes of your plumbing system. One of our technicians uses a special sewer-camera assembly that features a fiber optic camera and monitor. 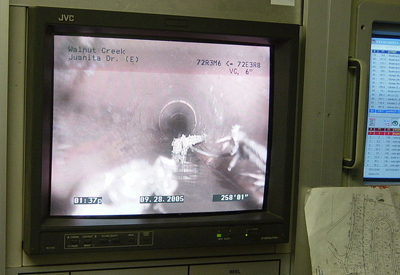 The fiber optic camera is fed by the technician into the sewer pipe through a clean-out or other accessible opening. If you are also having drain problems, like your sink is running slowly, shower is not going down or when flushing it’s coming back at you, give us a call. We provide all of your drain cleaning needs including mechanical snake, blow bag and repairs as needed.